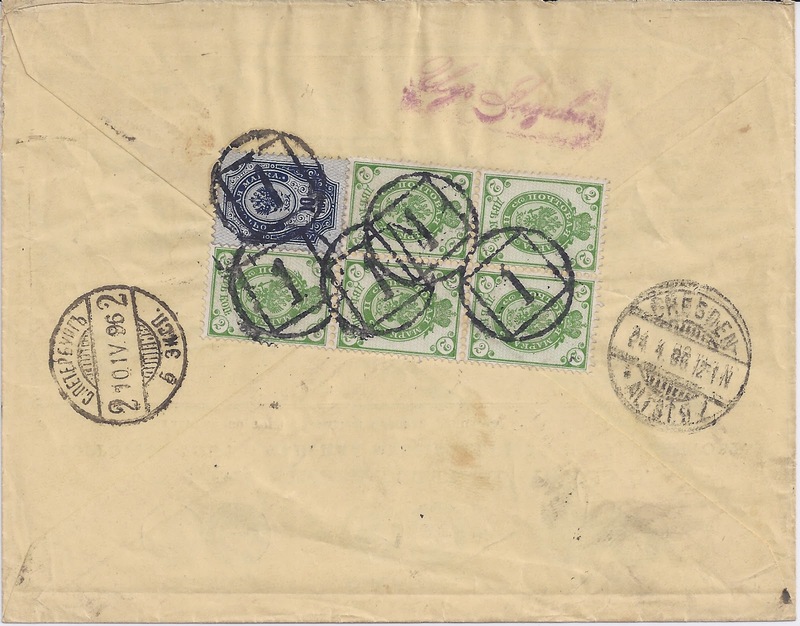 A notable feature of the Numeral Cancellations is that though they are found on letters, cards and banderoles, their use is confined almost entirely to cancelling low value stamps so that a numeral cancel on a stamp above 20 kopecks in face value is really very uncommon. It is very interesting to see these statistics about SPB numeral postmarks ! Most probably nobody has ever done it before. I had a collection of these already when in secondary school (that is a long time ago !) . Then I even exhibited them in the AMPHILEX 1967 youth class. I had never found the highest numbers , but my dad found the number 16 on a fragment in an antiquarian shop - that was a lucky day ! This number 16 is perhaps the rarest. I believe that Oleg Fabergé did not have it. To see in these statistics that #14 is in scarcity so close to #3 , #5 and #8 is a bit astonishing. I was always thinking that I can always find the numbers between 1 - XI , even in quantities, but that 2, 13, 14 and 15 are the difficult ones . And the highest numbers 16, 17 and 31 are rarities . There was plenty of mail between St.Petersburg and Finland . Therefore these numbers can still easily be found here on cards and covers. Also they have been a very popular field of collecting among Finnish collectors - especially because there are so many different types. By the way, Numbers 16 and 31 I will have in my big March Auction in Helsinki! I find the clustering in these numbers fascinating. Why would types 4, 9 and 6 be equally common? Why would types 7 and XI? And types 5, 8 and 3? In about 30 years of collecting I've owned one 31, seen two others and never owned or seen a 16 or 17 so my experience matches that of M. Vigneron.